After sharing my "work in progress" last week, it occurred to me that some of my readers might not be familiar with beach huts, I suspect they might be a very Britis phenomenon. My grandparents had a beach hut on the coast at Deal, Kent for many years. 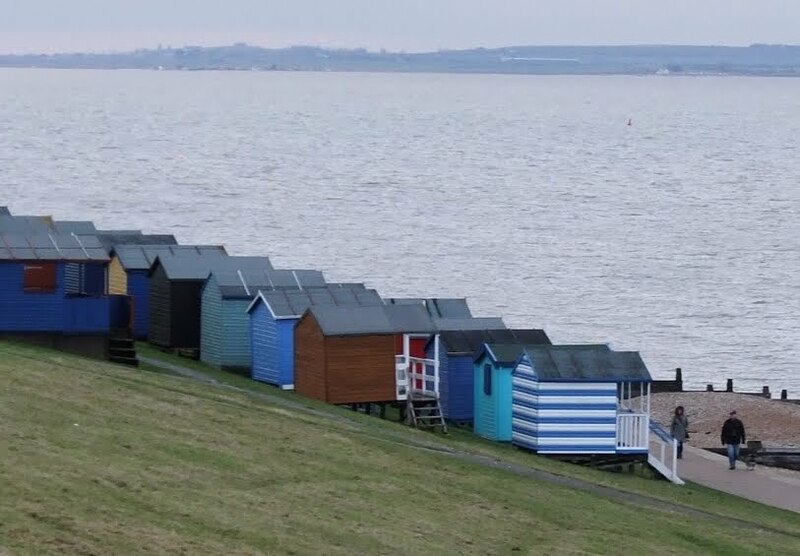 We'd huddle in what was little more than a shed on the seafront, wrapped in blankets against the howling wind and sipping tea from plastic beakers. They went out of fashion for many years, but are trendy one again. i desperately want one in Whitstable when we move there! 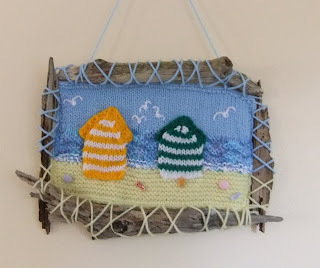 I've tried several methods of attaching the knitted seascapes to the driftwood. 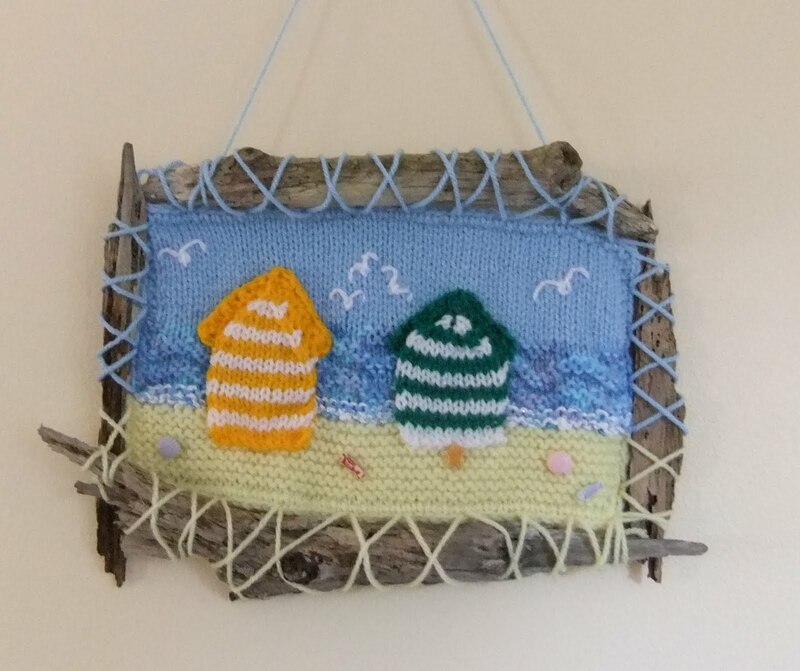 I've also decided I should have knitted to fit the driftwood, rather than trying to fit driftwood to the knit - you wouldn't not believe how hard it is to find driftwood of specific sizes! I started by lacing fairly "straight". I think I'd have preferred the wood to stick out at all of the corners, but the wood refused to stretch. I like the way the lower piece is crooked and has become part of the beach. I laced it with the "sky" yarn for the upper part, and the "pebble" yarn below. I tried using a contrasting yarn all the way around but it got too fussy. I can't decide. What do you think? Is there too much lacing? I'm not sure if it's becoming a distraction, too fussy, stopping the natural beauty of the driftwood showing to advantage? Or is it because the criss-cross lacing is in the paler yellow yarn that it shows too much? Maybe I should stick to using wood coloured yarn? I like the first one better, sorry Mr Nifty. Lucky you going to live by the sea. The funny thing is, Lynn, now that they're in photos and not in "real life" the criss cross doesn't look as good. weird! I love the idea ... went back & read last weeks part 1 as well. Personally, I think less lacing would look better, and be less distracting. It would show the wood more, and the picture more. you know how a trampoline (going with your example here) has space between the mat & the framing? Yeah ... I would go for a little of that. 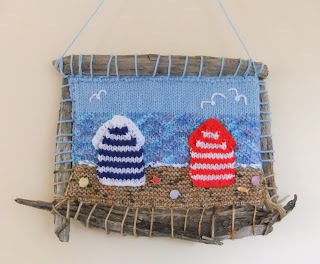 Another thought would be to use clear fishing line, leave a bit of spacing & see how that would look. All the focus would be on the knit & the wood... and the wonder of how its held together! As for the driftwood itself... I ould not worry at all about the size.. go for odd.. thats part of the charm of using it!!! I was planning on space, like the trampoline, but my driftwood was too small. I need a really good hunt! Otherwise it'll have to be two bits at a time on each edge. Still - no rush. It no doubt took a while for the wood to weather, so won't matter if I don't finish these immediately. Really appreciate your help everyone! I like both ways of doing it. I think they should all be done differently according to how you feel that day. Thank you Judy! It certainly seems that different people prefer different ways - so I guess it's a pick'n'mix! I've got yet another version to show tomorrow. Terrific pieces. I prefer not criss crossed..that's my 2cents to take to the bank!